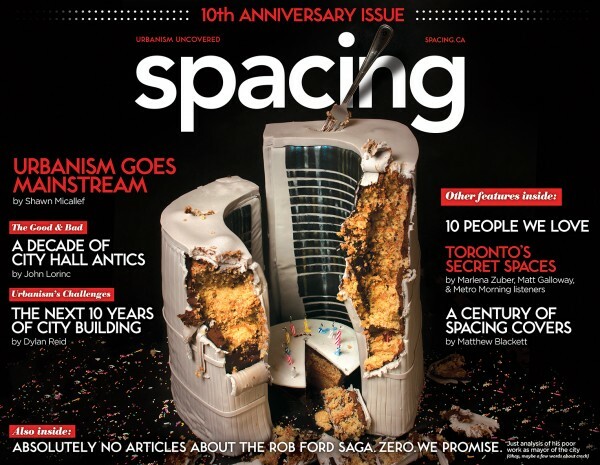 The release of Spacing’s 30th edition also marks the magazine’s 10th anniversary. Our editors take a look back at the last 10 years of urbanism and city-building. We invite you to come to our party and celebrate this milestone with us. We’ve confirmed our DJ for the night: our long-time friends Track Meet (Ed Keenan and David Morris). There will be some fun Toronto-themed activities, and a slew of items for sale from our e-store and prints from our contributors. At Spacing’s fifth anniversary party we let people in for a discount if they made us a cake. For our 10th anniversary we are going to make the task simpler: you can get into the event for $5 if you make us a birthday card. No store-bought stuff: this needs to be made with your hands or design skills. Show up to the party with the card and get in for half-price. After the party we will post a gallery of the birthday cards submitted. We commissioned pastry artist Sarah Fortunato to create a cake of Toronto City Hall for the cover of our 10th anniversary issue. And then we ate it. Sarah studied sculpture at OCAD and pastry at Grain, Curd & Bean on Dundas West, and now works to alter perceptions of what artistic dessert can be. Congrats on 10th Anniversary, I’m coming! Is that the TTC font you’re using on the cover?